Entrance to historic Calumet Farm in Lexington, Ky.
Trainer D. Wayne Lukas is in his second iteration of adding to iconic Calumet Farm's legacy. He's hoping the next chapter comes with the homebred 4-year-old colt Bravazo in Saturday's $9 million Pegasus World Cup Invitational at Gulfstream Park. Calumet Farm actually has two shots in the Pegasus, with Grade 1 Cigar Mile runner-up True Timber from the barn of Lukas' former assistant Kiaran McLaughlin. Calumet Farm finished third among all North American owners in purse earnings in 2018 with $6.3 million, according to Equibase.com. Its 86 wins ranked No. 7 nationally, and the farm was a racing secretary's dream with 599 starters – fourth-most in North America. Kelley's first start under the Calumet Farm banner was a ninth-place finish in an Oaklawn Park maiden race with Wine Glow on Feb. 7, 2013. In Kelley's 10th start as Calumet, Optimizer won the Fair Grounds Handicap (G3) – the first graded-stakes victory under the Calumet name in a decade. Three months later, Skyring won Pimlico's Dixie (G2) at 24-1 odds, followed an hour later by 15-1 Oxbow capturing the Preakness Stakes (G1). It was Calumet Farm's record 18th Triple Crown race victory and the first since Forward Pass won the 1968 Preakness. Oxbow's Preakness also provided the first Grade 1 in the Calumet Farm name since the Lukas-trained Horse of the Year Criminal Type won Saratoga's 1990 Whitney Handicap (G1). Criminal Type proved the last hurrah for Calumet Farm founder William Monroe Wright's sequence of heirs and in-laws who subsequently controlled the now 95-year-old Central Kentucky farm until it was sold at bankruptcy auction in 1992. 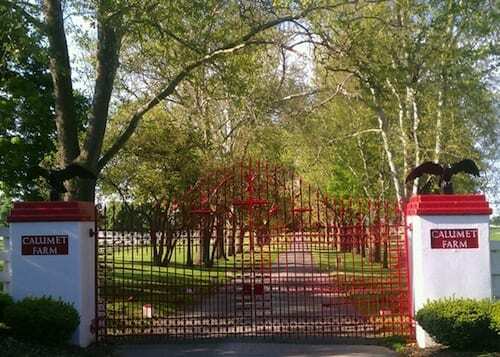 Prominent horse owner Henryk de Kwiatkowski paid $17 million for the property and $210,000 for the Calumet Farm name. Calumet operated as a boarding farm and passed on to de Kwiatkowski's children through a trust upon his 2003 death. The farm resumed a stallion operation, bred and sold a Grade 1 winner and had modest success racing, but nothing approaching what Kelley has done in five years. Today's Calumet has 17 stallions at its farm and six others in regional markets. A total of 308 Calumet-bred horses (not counting partnerships) raced in 2018, most among North American breeders, earning a combined $8.57 million that was topped only by WinStar Farm-bred horses, according to Equineline.com. Training True Timber for Calumet also has special meaning for McLaughlin, the Lexington, Ky. product who recalls field trips to the historic farm as famous for its meticulous white fences and white barns with red trim as its record eight Kentucky Derby winners, including Triple Crown legends Whirlaway and Citation. Kelley grew up in Franklin, Ky., and today lives in the Nashville suburb of Franklin, Tenn. The non-smoker made his fortune founding Commonwealth Brands discount cigarettes in 1991, selling the company a decade later for $1 billion to Houchens Industries. He ranks among the largest private landowners in America with more than a million acres, including an affinity for ranches. Calumet Farm is in keeping with Kelley's environmental and wildlife conservation efforts. He technically leases the property from his Calumet Investment Trust, which purchased the 798-acre farm for about $36 million in May, 2012. Kelley began racing as Bluegrass Hall in 2009, with Lukas among his first trainers. They teamed to win the short-lived Breeders' Cup Juvenile Sprint with Hightail in their first Breeders' Cup start together in 2012. “I told him, 'We're not going to stand on our laurels,'” Lukas said. Oxbow won graded stakes in 2013 under both Bluegrass Hall and Calumet, with Kelley using his black silks with gold chevrons for both. Calumet Farm's legendary devil's red and blue colors were sold at the 1992 bankruptcy auction for $12,000 to Brazilian businessman Goncalo Torrealba. Having brought Calumet back to prominence in 1990, Lukas says it's harder to get to the top today from the ground up, with powerful owners teaming together to buy into proven horses. “But I really feel that Calumet has the wheelbase to do what they want and that in years to come they'll be a force,” Lukas said. This entry was posted in Pegasus World Cup and tagged Brad Kelley, Calumet, Calumet Farm, d. wayne lukas, kiaran mclaughlin, pegasus world cup by Press Release. Bookmark the permalink.